Below you will find a list of the most frequently asked questions. If yours is not one of them, please use the Contact Form to submit your question and we’ll get back to you. Do you charge a fee for any of your services? No, this service is free of charge for job seekers. How are the jobs filled? After your skills and experience are evaluated by our recruiters, we compare your qualifications to existing and new client requests. If your profile matches the requirements of our clients, we will contact you and set up an interview. No, it is up to you whether you take the job or not. We want to ensure the job is a good fit for your career path. How long do the jobs usually last? The length of time of each job varies greatly. Some jobs are only for a couple of months, some several months, many are a year and longer. Every job is different. 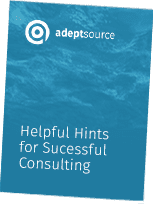 Whether you are new to consulting or not, these tips will ensure a successful engagement for both you and the client. Download today! Great clients demand great IT Talent. If you possess technical greatness, take a gander at our exciting opportunities.